Lewis Leslie McCollough obituary. Carnes Funeral Home. 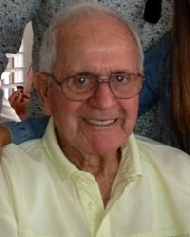 Lewis Leslie McCollough, 83, passed away on June13, 2015 at the Methodist Hospital. He was the husband of Victoria Sanchez. They shared 53 years together in marriage. Lewis was born in Warren, Pennsylvania, he was the son of Franklin Pierce McCollough and Margaret Eleanor Hollibaugh. He served our country as a fighter pilot for over 20 years. He enjoyed hunting, fishing going to the gun range, playing cribbage with his grandson and never missed a celebration. He will be remembered for his integrity, dedication to his family and friends, and his love for life. He is survived by Victoria McCollough, children Bianca Clayton and Patricia Mariner; brother, Rod McCollough; grandchildren Lee Nicholas, Tracy Nicholas and Lannette Wood; niece, Paula Duonomo. Memorial donations/ in lieu of flowers may be made to the charity of your choice.